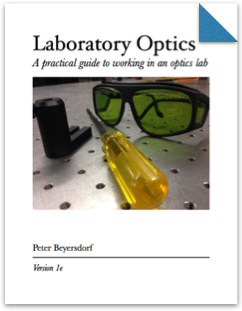 The author draws on years of experience in research and teaching of experimental optics to provide practical tutorials on some of the most common (and often misunderstood) tasks involved in typical optics experiments. In concise, high-def videos, various skills and techniques are demonstrated and explained. These cover topics for the novice, such as mounting and cleaning of optics, as well as for the more advanced learner, such as balanced detection, and lock-in amplifiers. See the full list of embedded videos. 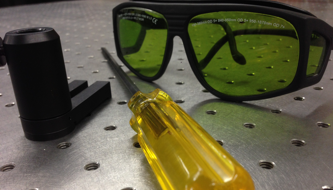 A multimedia interactive guide to developing practical skills for optics research. Use as an instructional tool or as an indispensable reference! The Beam Alignment Simulator provides a playground for practicing the process of aligning beams and interferometers. The Fabry-Perot Cavity Simulator allows the parameters and alignment of a Fabry-Perot cavity to be manipulated while observing the effect on the transmission spectrum of a modulated laser beam. Gaussian beam curve fitting for determining the beam parameters from a series of beam radius measurements. Mode matching calculator for determining the optimal position for mode matching lenses. Polarization visualizer allows you to manipulate waveplates and polarizers while visualizing the effect on the beam polarization.